They are two very hard working athletes who in 2012 had their Olympic dreams ripped out of their hands. After all, to participate in the Games is the dream of every serious athlete. 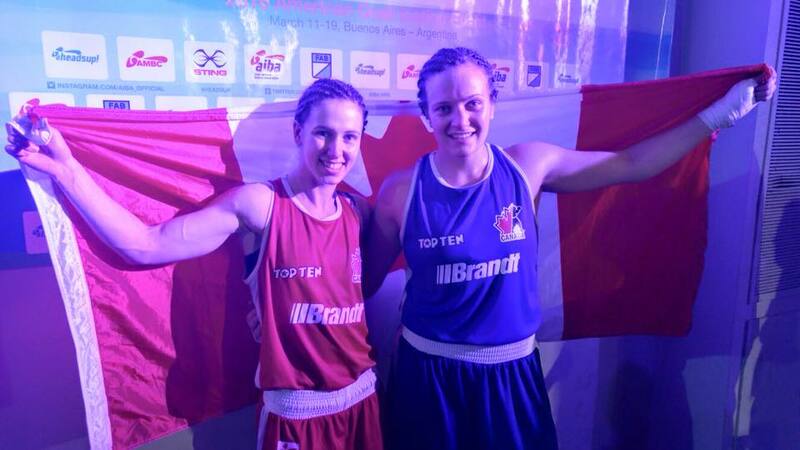 Mandy Bujold (51kg) and Ariane Fortin (75kg) have dreamed and worked many extra hours for many years. Making drastic changes in their lives over the past four years, they didn’t want a wild card to get them to the Olympics, they wanted to earn it in the ring. Forty days before the Olympic Games in Rio, the two Canadian boxers keep their focus on preparation, that according to Bujold hasn’t changed at all. “I am not doing anything different. I am sticking to the key things that got me to this point. There is no need to change everything just because it’s a bigger event. I am focusing on polishing some key skills and having a great training camp.” said the 2X Pan American Champion, Mandy Bujold. On the other hand, Fortin has included only one element in her routine, and that is to do an analysis of her 11 possible opponents. “For this competition, since there are only 12 boxers in the tournament, we can focus on doing specific work for each of them.” said the 2X World Champion, Ariane Fortin. It doesn’t matter we can see Mandy breaking pieces of ice while the wolves look at her in the COC Brand Campaign video ”Ice in our Veins’‘ ; she takes it all that in for what it’s worth, getting good media exposure prior to the Rio Games. Ariane, meanwhile, charms the French media with her friendly personality and very outspoken mind. She is one of those boxers that makes friends anywhere she goes. But now is the time to focus on what is serious for both female boxers. They will go to the most coveted ring in the world representing the country they feel proud of while also giving Canada the credit it deserves as being the first country to allow women boxing competitions in the amateur arena. Mandy and Ariane schedule media interviews and public appearances around their hours of being in the gym doing what they like the most. “The nice thing is that most of the media stuff was done months ago. If I have time to do one event during the week that doesn’t interfere with my training, then I don’t mind going.” said Bujold, who says after Olympics she will take time off to enjoy life, relax and reflect on what lies ahead. Fortin confesses that she isn’t sure if she has grasped her Olympic status. “I don’t know if I really have grasped everything, but I am trying to stay grounded as much as I can, to do whatever is in my power to perform well in August and to focus on the present moment.” said the Quebecois Sweetheart, as many call the blue eyed blond. Both boxers leading to their life dream agree on the need to stay focused, humble and sticking to their daily routine. A difficult task when all eyes are on them, especially within the Canadian boxing community. Leading up to the Pan American Games we knew Mandy always wrote affirmation notes that she plastered on her Toronto apartment walls. But leading to the Olympics she says it is too soon to do it because she doesn’t want to create too much anticipation in her mind. “Each day I set small goals for my workout and I focus on that in the gym. One day at a time, one workout at a time, one round at a time.” said the Kitchener daughter.